I’m an ADI from Nottingham and I only teach in a fully electric Nissan Leaf. This series of articles covers the realities (no fairytale figures) of life in an electric car both as a driving instructor and for family use. This time I’d like to look at a typical day as an ADI in an electric vehicle (EV) with an honest summary of any problems and hurdles that can arise. About 11pm before going to bed I switch on the car charger. Mine is controlled either via an app, timer or a switch installed inside the house. The car is always back to 100% by 3am which is quicker than I ever need it to be, as long as it’s done by 9am I’m content. I climb into my toasty warm pre-heated Nissan Leaf about 9:15am. The pre-heating/cooling/defrosting can be activated via a timer inside the car by which you tell it what time you want to leave and it makes sure the car is ready. You can also control this via an app which many find a bit erratic but I’ve found fairly reliable. In terms of range my 30kWh battery averages 125 miles whereas the new standard is 200+ miles. I do a lesson 9:30-11:30am after which the battery will be at about 85 miles. I nip home to feed the dogs, eat my lunch and head off for my 12:30-2:30pm lesson. At the end of that lesson my range will be about 45 miles. That’s sometimes me done for the day with a redundancy of 45 unused miles. But I often do evening lessons so let’s assume I get home at 3pm and plug in. I’ll do all my ‘paperwork’, make dinner, walk the crazy dogs and then get back into the car at 6:15pm. Because a 7kW home charger adds 30 miles per hour it is always back at 100%. I’ll do my 6:30-8:30pm lesson and finish the day on a redundancy of 85 miles. Home chargers are one of the greatest advantages of an EV, gone are the days when I get into a cold car and realise I need to visit the petrol station. 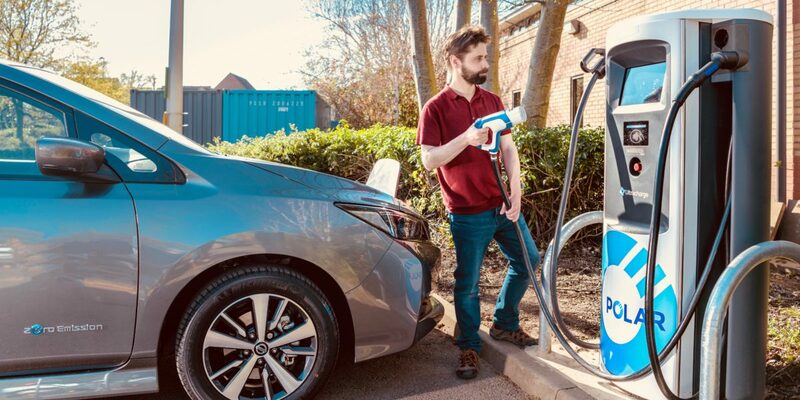 60% of the UK population have off street parking and so could benefit from a home charger, 40% would be reliant on public infrastructure no different to an ICE (internal combustion engine). Occasionally I do an 8 hour day or a 100 mile motorway lesson and in these circumstances I’ll just use a rapid charger for 30 minutes. Who seriously can’t take 30 minutes out of an 8 hour day to rest? Next year I’m switching to a modern 50/60kWh EV offering 200-300 miles of range. This significantly exceeds my needs and as a consequence I’ll probably never rapid charge again. I’ll miss plugging my car into a public charger and talking to random curious passersby about how awesome my car is. It is worth mentioning Policywave are being pro-active trying to get more insurers on board for us, unfortunately myths and misconceptions sometimes stand in the way. C&A Mackie, BG Insurance, Park Insurance and the DIA are intending to insure EV’s for ADI’s in the near future. My personal experience is that the cost of my insurance has been little different in an EV to an ICE but others have reported an increase of about £200. If you need to rely on the public network do your research to ensure your area meets your needs. The network is patchy with some areas being excellent and others terrible, it will get better because about 400 new connectors are installed each month. I’m lucky to live in Nottingham where we have 200+ public chargers and using an EV is relatively easy even without a home charger. Across the country there are now over 12,000 chargers due to exceed 25,000 by 2025 compared to 8,500 petrol stations. About 60% of the population will be using home chargers anyway which reduces strain on the public network. Check www.plugshare.com to research the current suitability of your area. The only times I’ve experienced technical problems were at motorway service stations and with both occurrences a call to the helpline to reset the system eventually got things working. Amusingly one time this left myself and 2 other EV drivers temporarily stranded while we talked to each other about how much we loved our cars. I would counter balance by saying I’ve experienced more problems with fuel, my local fuel station shutting down for a revamp caused a 7 minute detour to the next one and long queues due to demand. Only yesterday did I drive down the M1 to see signs at 2 service stations in a row declaring ‘NO FUEL’ yet the electric cars still had access to charging. Also our motorway chargers are programmed to default to ‘free vend’ if they lose connection to the payment system, you wouldn’t get that in a petrol station. The biggest problem is charging bays being ICED meaning when an ICE car parks in a charging bay blocking access. I would suggest I’ve experienced this 5% of the time I’ve wanted (not needed) the public network and it is very frustrating. It is a difficult problem to solve although it is being tackled through enforcement and technology. Some EV drivers are just as guilty of using these spaces like parking spots when in fact they are charging bays. Another issue has been unnecessary complexity with different chargers requiring apps or RFID cards to activate. Once you get the hang of it this isn’t too bad but it’s annoying that hurdles are put in the way of activating a charger, however we are now seeing the welcome change to ensuring all can be activated just by swiping your debit/credit card at them. With increased simplicity comes improved reliability due to electric cars possessing about 90% less moving parts. Yet all technology has the ability to go wrong so I’ll report on our negative experiences so far across about 70,000 miles total. Our first Nissan Leaf developed an annoying squeal when reversing which Nissan mostly resolved but it never quite went away. Our new 40kWh Leaf had a faulty sensor which kept activating the ‘autonomous brake warning’ on the dashboard. Nissan gave us a temporary replacement Leaf, fixed the sensor and we received a £50 apology. EV batteries tend to be warrantied for 8 years and 100,000 miles which is better than the warranties of most combustion engines. All cars lose efficiency in very bad winter conditions but it’s more noticeable on an electric car. To roughly calculate average range multiply the battery size by 4, to calculate worst case scenario multiply by 2.5. My 30kWh battery averages 125 miles but in very bad winter conditions I did experience as low as 80. A modern generation 60kWh battery might fluctuate between 160-270 miles but it should normally average a reliable 240 miles. I intend to be honest with any future problems I might experience but the realities so far have been overwhelming positive.